Beginning with her early days on the scene in SoCal, comedian Margaret Cho has always been the Agent Provocateur of stand up. Never one to shy away from a difficult, or even ‘taboo’ topic, there is no subject off limits. Her socially aware brand of comedy has made her both a thought leader as well as a teacher to those with open minds and open hearts. Her latest DVD release, Cho Dependent, filmed during her 2010 tour, finds Margaret in her usual top form, riffing on smart topics that actually matter. In some ways Cho Dependent is a return to form, with fresh stories about her mother and her grandparents that have never been told before. Cho fans know that her unrestricted view of family life were an early indication of her willingness to share everything with her audience. 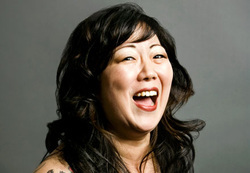 Uncensored, but never unhinged, Cho also takes aim at the Palins, her stint on Dancing With the Stars (where both gay pride and bullying were platforms for her), smoking pot and living in a world with ‘sexting.’ Honest, passionate and hilarious, Cho Dependent is simply Margaret Cho at her very best.